Oxygen—it's a basic necessity for animal life. 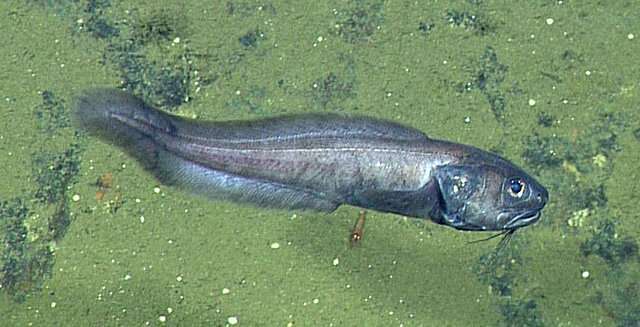 But marine biologists recently discovered large schools of fishes living in the dark depths of the Gulf of California where there is virtually no oxygen. Using an underwater robot, the scientists observed these fishes thriving in low-oxygen conditions that would be deadly to most other fish. This discovery could help scientists understand how other marine animals might cope with ongoing changes in the chemistry of the ocean. In 2015, Barry, Gallo, and eight other researchers conducted a series of dives in several deep ocean basins in the Gulf of California using MBARI's remotely operated vehicle (ROV) Doc Ricketts—a state-of-the-art underwater robot. Gallo was particularly interested in these areas because her Ph.D. thesis focuses on animals that live in very low-oxygen environments. The deep waters of the Gulf of California have some of the most extreme low-oxygen habitats in the world. 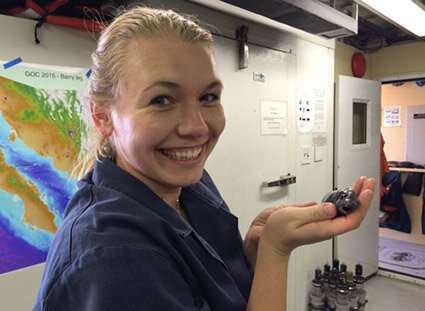 "I could hardly believe my eyes," Gallo wrote in MBARI's cruise blog following an ROV dive in the Cerralvo Trough. 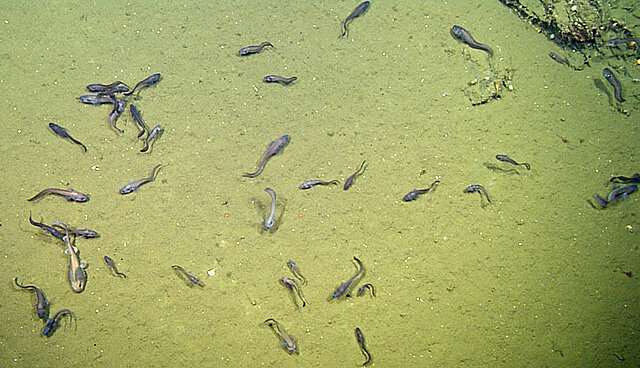 "We observed cusk eels, grenadiers, and lollipop sharks actively swimming around in areas where the oxygen concentration was less than one percent of typical surface oxygen concentrations. We were in a suboxic habitat, which should exclude fish, but instead there were hundreds of fish. I immediately knew this was something special that challenged our existing understanding of the limits of hypoxia [low-oxygen] tolerance." "Many other types of fish are considered tolerant of low-oxygen conditions," Barry commented." But the fish in these parts of the Gulf are like the winners among a group of elite Olympic athletes." The researchers still don't know exactly how these fish are able to survive, and even thrive, under such harsh conditions. Both the cusk eels and cat sharks have large heads with vibrant red gills, which may be particularly good at absorbing oxygen from the surrounding water. 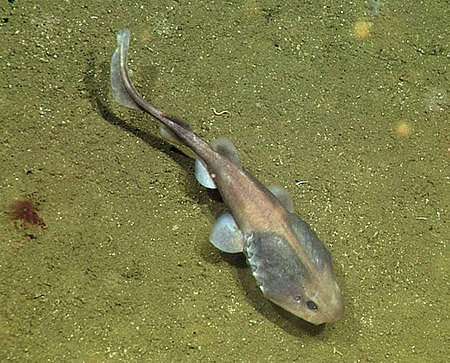 The fish are also small—less than 30 centimeters (one foot) long—with soft flabby bodies and thin, weakly developed bones—all traits that might help them conserve energy. "We hope to go back to the Gulf soon to try and address some of these questions," Barry said. I suspect that water from oxygenated is the source; perhaps a down draft of oxygenated water from above is pouring into this area like a river current. I also assume this happens frequently. Possible that the Sodium Chloride, Calcium and water channels become more important, Sulfur dioxide possibly? Bright red gills similar to the tube-worms near thermal vents with high acidity and lowered oxygen, dependent on microbes for creating food and respiratory oxygen path for the system or some other electron-donor element/compound is responsible. This is showing 'higher evolutionary animals' as fish are considered, dont all require the high oxygen content favored by us, some places they have managed to not all be poisoned out by the oxygen increase. Both fish types are archaic lineages and may be one reason that life has managed to survive several extreme changes in the past, whether chemical, volcanic or astro-physical conditions, such as impacts from both meteoroid and comets, each with their own problems and types of changes possible. Cometary impact could cause widespread chemical changes as well as impact damage, fire from vaporized volatile chunks is plausible. Well, it is safe from most active predators down there. Perhaps they're just killing time ?? Er, gills don't work that way. They don't extract the oxygen atom from water molecules, separating them from the two hydrogen atoms, they take in free oxygen atoms dissolved in water.